A remarkable collection of this often reviled but endlessly fascinating area of the English language, it covers slang from the past five centuries right up to the present day and contains 10.3 million words, over 53,000 entries covering 100,000 definitions of words and phrases, and includes over 413,000 citations. 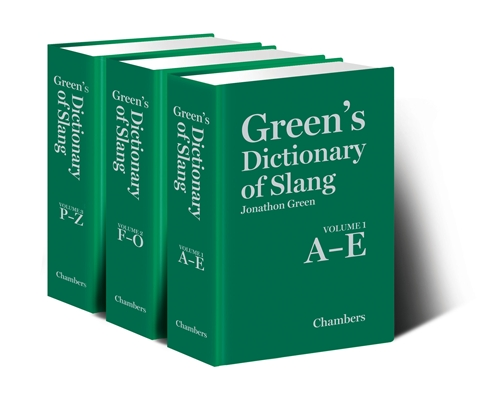 This three-volume set of Green’s Dictionary of Slang demonstrate the sheer scope of a lifetime of research by Jonathon Green, the leading slang lexicographer of our time. A remarkable collection of this often reviled but endlessly fascinating area of the English language, it covers slang from the past five centuries right up to the present day, from all the different English-speaking countries and regions. Every word and phrase is authenticated by genuine and fully-referenced citations of its use, giving the work a level of authority and scholarship unmatched by any other publication in this field. Green’s Dictionary of Slang is a groundbreaking work. Quite simply, it is the most authoritative and comprehensive record of slang ever to be made available.